Eligible Candidates can Download Assistant Manager Admit Card at the Official Website of SEBI. 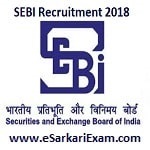 Open SEBI Recruitment 2018 Download Call Letter Link. Open Download Call Letter Link. Fill Required Details and Click Login Button. Open and Download Call Letter. Take Printout of Admit Card.